Communicating your expertise to potential customers, without selling. Blogging is an art that needs practice, patience and persistence to become good at. There is nothing difficult about blogging, yet many businesses fear the blog and writing content about their business. Blogging feeds into so many aspects of digital marketing, without it, many businesses will struggle to succeed online. So let’s start with the basics and look at what exactly blogging is. 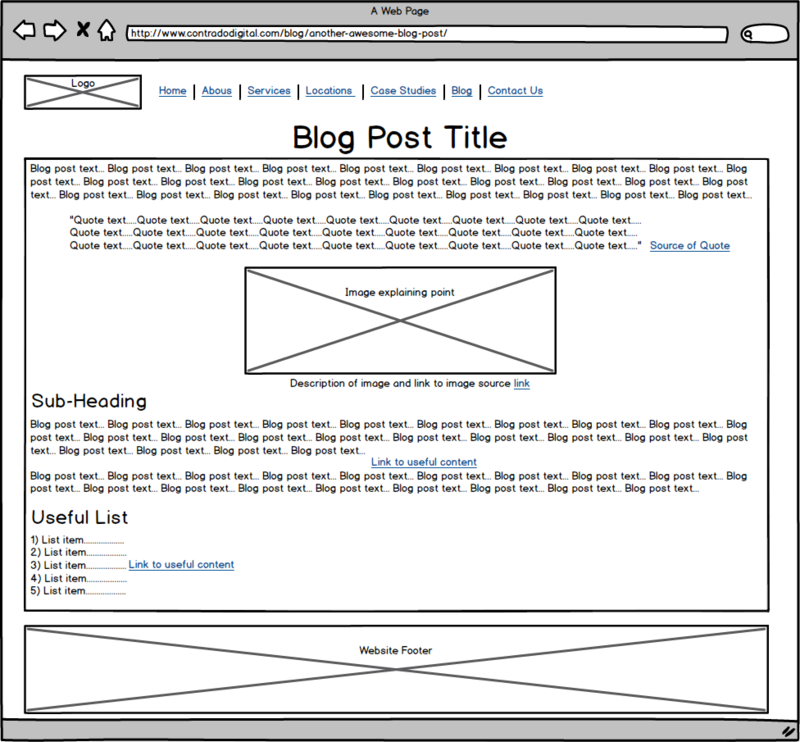 Blogging is the task of writing a blog post, which will then sit on your blog. The best non-technical way to think about a blog post is that it is simply a page on your website which has a date for when the blog post was published. Your blog will list all blog posts in reverse chronological order automatically so that anyone reading your blog can read through relevant blog posts either about your company, staff or experience. Blogging is an essential part of your digital marketing strategy which naturally feeds into the content you post on social media, the content included within your email marketing campaigns, the content promoted on social media advertising platforms, the content that is included as part of your sales process, the content that is integral to your recruitment talent attraction strategy and more. Your blog is the place where you can showcase the expertise of your business and your staff along with talking about awards and other charitable events you are getting involved with. Blogging brings your business to life and shows people that there is more to you than just your products and services. There are many blogging platforms available to work with. To cut your research short, just use WordPress. It is by-far the most popular blogging platform in use on the internet today, powering over 23% of websites on the internet. It is the most popular because it is the best. Being a free to use open source content management system means that you and your business keep control of your blog at all times. WordPress is an extremely powerful platform that is capable of blogging, which allows you to customise everything you could ever need. Take a look through a selection of the features available within your WordPress website and blogging platform. One important topic to note is that if you are using multiple technologies or platforms behind your website, there are a few things to consider to maximise the SEO value from your blog. Another reason why we always recommend using the WordPress platform which comes with a lot of SEO benefits that are already built in. One of the common concerns businesses have with blogging is around what to write about. The quick answer to this is ‘something’, just write about something that is important to you, your business, your customers or your industry, just something that makes your business look awesome and genuinely adds value to your customers’ lives. It is extremely important that all blog posts you write are representing your brand in a positive and professional way. Allowing anyone in your company to run the blog on your website will result in typos, random blog posts, quality issues and more. All of which isn’t going to represent your business in the best way possible. Your blog is a customer facing part of your business. In the same way that you wouldn’t leave your shop dirty from the night before, you wouldn’t want to make your blog look dirty either. Keep everything clean, professional and useful. Have you been shortlisted in any awards recently? Have you achieved a new accreditation? Have you recently moved office? Have you recently received investment? Have you recently recruited a number of staff? Have you recently won a handful of new clients? Have you recently expanded into a new market? Another common question businesses have when it comes to blogging is how often they should be blogging. This partially comes down to the resources you have internally or the budget you have for external support for a company such as ourselves to help. Generally speaking, all businesses should be looking to blog at least monthly and ideally weekly. There is no right or wrong frequency for blogging, this hugely depends on the industry you are working in. Whatever frequency you decide works well for your business, stick to it. Blogging rapidly for a whole month then stopping for 6 months is not going to cut it. The point of blogging is to keep your business in the forefront of your customers’ minds for when they are ready to purchase your products or services. Throughout this nurturing time, you have the perfect opportunity to educate your clients in a friendly and non-sales focused way. So that when they are ready to purchase, they will remember you for the value that you have added to their business through your blog. The same is true for customers who purchase infrequently. By communicating with them on a regular basis, other than to simply check in and ask how they are doing, you can provide useful information about how industry changes affect their business and what they need to start thinking about for future growth. Who are you writing for? Seriously. Are you just blogging because someone told you that blogging was a good idea, or are you writing for a specific set of customers or customer segments? In case this isn’t obvious, it is essential that you are writing for a specific group of customers. If you aren’t you are just wasting your time. What are their main problems? What topics are they interested in reading about? What content do they share on social media? What are they interested in personally? We’re targeting managing directors of companies who work in the manufacturing sector and employ between 10-30 staff with a turnover below £10,000,000. We’re targeting marketing managers of companies who work in the online retail or ecommerce sector and are struggling to find time in their day to keep up with all of the changes within the digital marketing industry. We’re targeting ambitious growing tech startups who have built a fantastic product or service and need digital marketing support to seriously boost their website traffic and revenue. When you know who you are targeting, the next question to ask is what are you actually looking to achieve from blogging? Is it related to promotion, PR, educating readers, helping with SEO campaigns, to use as a business tool during the sales process, direct traffic generation, generate sales, enquiries or something else completely? Understanding the objectives of your blogging activity will help to assess if the content being written about is working towards those goals. Each piece of content will have different objectives which should fit in as part of your overall digital marketing and business strategy. You may even have multiple blogs on your website such as how we have segmented this based on the general blog for clients, business owners and marketing folk along with the developer blog where we get a little geekier with the content we write about. This type of content can help showcase expertise to others in the industry along with being used to raise our reputation and attract the right talent to work with us. Then beyond this we have a growing digital marketing resources section designed to filter through the noise in the digital marketing world and help people understand key topics without having to trawl through endless opinionated blog posts around the web from various sources. What are your content objectives and how does this fit within your overall marketing and business strategy? Content structure is one of the most important factors to get right. Writing a blog post like a book is boring. It just isn’t going to work online. The structure of your content needs to be structured in such a way that caters for all types of readers including those who skim read content and those who like the level of detail that backs everything up. Large chunks of text in a blog post will bore people to death and will put them off reading it. White space is your friend and significantly helps with readability. You will also notice that the paragraph lengths for only content generally are much shorter than you would read in a printed book or report of some kind. Most importantly though, make sure you have something good to say when you are writing. Make the content fun, informative and exciting. Don’t be afraid of using bold in your content to emphasise points, this isn’t seen as shouting when writing online. If you made some text bold in an email or report then this clearly wouldn’t go down too well, but this doesn’t apply online. Headings, sub-headings, quotes and more help readers to quickly skim through the content and narrow in on the bits that they are interested in. With so much content being created on a daily basis online, the easier you can make it for people to read or skim read your content, the more successful that content will be. There have been various studies to show that content that is well structured receives significantly more social media shares than similar content that is poorly formatted. Lists, these work well too, don’t be afraid to use lists. A perfect way to bring your blog posts to live is through creative imagery. Illustrations, photographs, designs, diagrams and more can help to encapsulate your point extremely well without a reader having to read through all of the text. It’s important to note that you need to ensure you reference any images that you use and/or that you have the permission of the creator to use those images. Certain large online stock photography websites have teams of people who are actively trawling the web looking to write legal letters to businesses who are using images that they don’t have permission to use, and this is a costly process to resolve which cannot simply be brushed away. When you have multiple authors on a blog it is essential to put together some editorial guidelines so that there is consistency to what is being written. There is nothing worse than a blog with many authors all trying to achieve significantly different goals and with significantly different writing styles. Capitalisation, what do you capitalise and what do you not Capitalise? Should Search Engine Optimisation be capitalised or not? Abbreviations, e.g. Do you use i.e., aka, a.k.a, SEO or search engine optimisation? Same word, different spellings such as e-commerce, ecommerce, E-commerce, Ecommerce, E-Commerce? Facebook Like or Facebook like? What is the style and tone of your blog posts? Conversational, educational, academic, funny, controversial, objective, subjective, opinionated, sophisticated? How does this link up with your audience groups? A managing director may like to hear words like revenue, conversions and website visitors whereas a lead developer may want to hear words such as performance, optimisation, speed, efficiencies and many of the underlying technologies which the managing director would likely not be too interested in. Alignment of images, should these be left aligned, centre aligned, right aligned? This can make or break a blog. Should we use numbered lists or bulleted lists? How do we reference or quote content and what sources are allowed or denied? If you are a newspaper, it is unlikely that you want your editors referencing your main competitor newspaper. Are we allowed to use colours to highlight sections of text? How do we use bold, italics and underlines to emphasise points? There are many more questions you can ask yourself and it is essential that you give this some thought as your blogging team grows and also when you are working with an external agency to support your content marketing efforts. Since simply stating that “something doesn’t feel right” about the content isn’t exactly the most useful comment. Instead, being able to refer to a style guide for your brand and business will help to show exactly why something is not quite right or not quite on brand. To highlight all of the points within your style guide, provide examples for people to follow. Simply stating a point often can be open to misinterpretation for certain areas. So instead, provide clear examples of what to do and most importantly what not to do. Or don’t encourage comments. 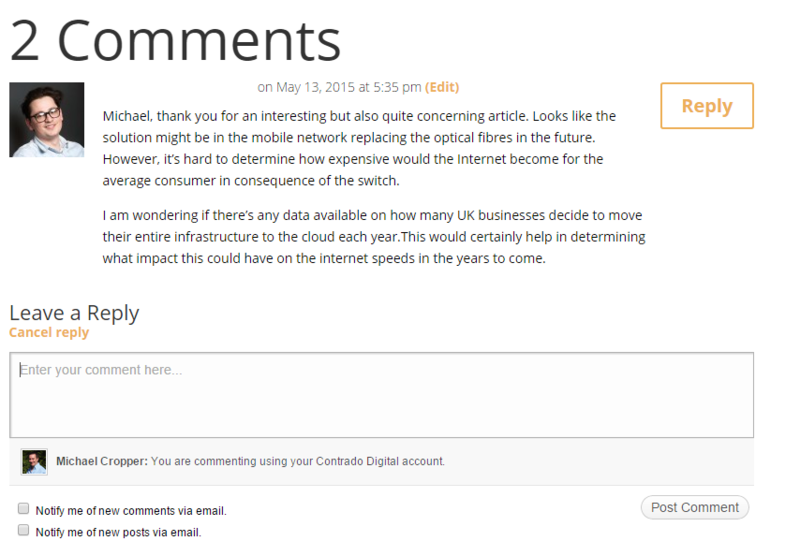 Whatever you prefer on your blog, either allow or disallow comments to be added. Comments can be a great way of engaging with your audience but they can also become a burden to manage spam comments, even with the most sophisticated spam filters there are always instances where spam slips through the net. Some companies have actively turned off comments due to the nature of how much spam they received and the burden of managing this junk on a daily basis by members of staff. For most businesses and blogs, comments would be a wise area to encourage readers to get involved with. Particularly for blog posts which are a little controversial or blog posts that have a high level of research or data behind them. Comments can be difficult for people to engage with so there are many options for improving this process by using platforms such as the built-in WordPress commenting technology, Disquss comments, Facebook comments and a whole host of systems in between. Beyond encouraging comments, how are you going to notify people who have had a response from another person who has left a comment? If you are new to blogging and aren’t that technical, you may find that your web hosting company has turned off certain email technologies which are open to spam. As such, you may need to configure a few technical bits so that your automated email system for comments works effectively. This can be different based on many different factors, so if you need help with this then get in touch. Build it and they will come? No. Blog posts need promoting and sharing with your audience whether this is on traditional social media channels such as Facebook, LinkedIn, Twitter, Pinterest or on other channels such as your email newsletter. Let’s make that as easy as possible for your readers. One of the biggest problems we see when businesses start blogging is that they don’t track results accurately, or most importantly don’t know how to track results accurately. Getting this right allows you to collect data about the performance of your blog posts and ultimately make better decisions about where your blog is heading and if it is targeting the right audience. 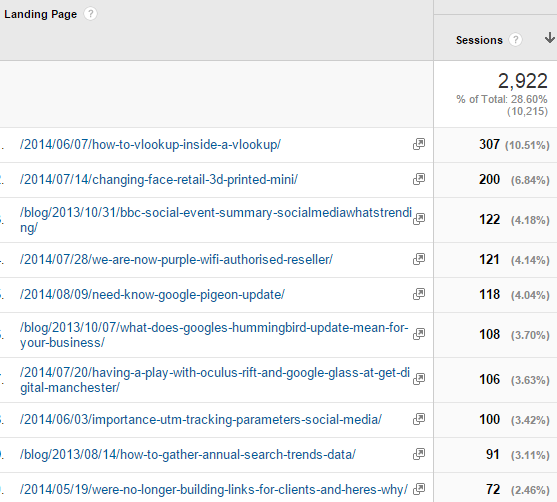 Below are a selection of tools that can give you the data you need to understand how your blog posts are performing. Use them. Always. As a comparison, if you were writing 2 blog posts per week yet you weren’t getting any traffic to those blog posts, maybe it’s time to start doing something about that. Likewise, this also helps to show you which blog posts are the most popular given a specific date range, within a specific category and more. All of which helps you to understand the type of content your audience is interested in. Another important point is that this data allows you to see how long your content lives for. For example, if you are always writing blog posts about an event next week, then the life of this blog post is simply a week or so. Whereas if you are writing evergreen style content then you can get much more bang for your buck, so to speak. This is hugely important to make sure your activities are tracked accurately. This has been covered in a great deal of detail in a blog post about the importance of UTM tracking parameters and we always recommend businesses use our free social media tracking tool so that you can guarantee that your data is being tracked accurately. If you choose not to use these tools, then quite simply, your data will not be 100% accurate and can lead to you making bad decisions based on the inaccurate performance data of your website. If data showed you that something wasn’t performing, yet it actually was and it was just the data which was inaccurate, then you stopped doing that activity, this is clearly no good for business. Data accuracy is hugely important. Guest blogging is an area that many people will have experienced in one way at some time. Whether you have been approached by someone else who wants to write a guest blog post on your website or whether you have contacted someone else to write a guest blog post on their website. Either way, use guest blogging sparingly or possibly not at all. If you have been contacted by someone asking if they want to leave a guest blog post on your website, your first reaction may be “Yay! Someone likes the blog. Plus I don’t have to write all the content anymore which is quite time consuming, this sounds like a great deal, let’s go ahead with this”. The reality is that you need to be very aware of the reason why they have contacted you in the first place. Often, the reason why they are contacting you is because they are a spammy SEO company or a business who has listened to bad SEO advice and purely wants a link from your website to their website. All in the guise of a guest blog posts which is ‘apparently’ benefitting you. Be very wary of this. Google is extremely good at spotting spammy guest blog posts which can ultimately cause harm to your website you’re not careful, in terms of losing website traffic. If you are looking to write guest blog posts on other websites, again be wary of what you do, why you are doing it and what you are looking to achieve. If you are going down this route purely for SEO reasons, then you should probably not be doing this. Instead, if you are genuinely looking to become a contributor to a large website with a large audience, you are a genuine expert in your field and genuinely have something valuable to add to that website, then go ahead. Other websites will have strict guidelines in place about what you can or cannot do when it comes to guest blogging, or more commonly referred to as a contributor or contributing editor in more professional websites. As such, your aim here should be to share some genuine useful information to that audience and if you manage to include a link within that content, you should be looking to generate traffic to your website rather than looking for the SEO value which that link may bring. If you are genuinely looking to build your brand and business, ask yourself the question when looking at guest editorial opportunities… “How many people are likely to read this article and how much website traffic am I likely to get from any links within the content?” If the answer is none or very little, then maybe this isn’t such as a good opportunity. As can be seen throughout this guide, blogging can be an extremely powerful tool to build your business, showcase your expertise and connect with your audience on social media channels. Blogging requires a structured and well thought out approach to be successful. It also requires a sustained effort over time to build your audience and connect with them effectively. Most importantly, track everything as accurately as possible. Only with data will you be able to understand what is working and what isn’t working. Based on this data, you can then make strategic decisions about how to improve the performance of your blog over time. One final thought, if you aren’t blogging yet, get started and keep going!